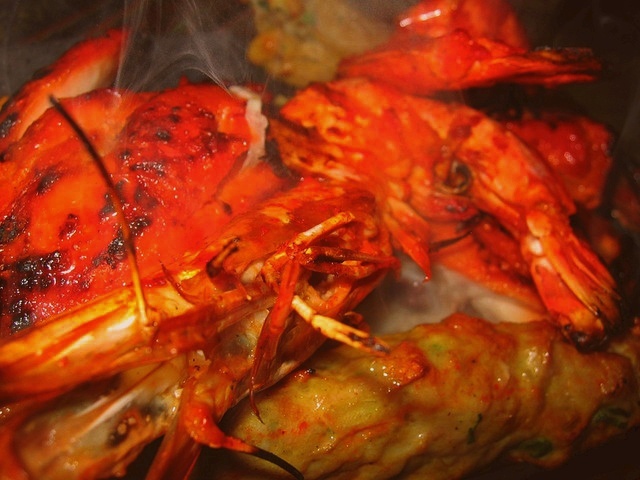 Recipe for Tandoori Prawns. Prawns marinated in tandoor spice. Singaporean favourite Indian bbq dish. This recipe serves 7-8 persons. Mix all the ingredients together. Let the prawns marinate for at least three hours. Bake the prawns in an oven at 200 for 15 minutes or over a girdle for 15-30 minutes with medium heat. Do not over cooked. Serve warm with salad leaves and lemon slices (squeeze juice over prawns just before eating). can i use chicken instead? any recipe difference for the masala? anyway tx for the tandoori recipe. I loved this recipe. Going to try this for my bbq gathering this weekend! Nice post! I let this marinate about 4 hours and these were fabulous! Thanks for a great recipe! simple yet delicious dish! i love huge prawns bbqued! fresh prawns have unique seafood flavor that goes well on fire.